Statistics show that the Italian shipbuilding industry produces vessels with the highest average value. This is due to the considerable contribution made by the building of superyachts, vessels whose hull exceeds 24 metres. In the building of this specific type of pleasure craft Italy is world leader for the number of projects under construction. 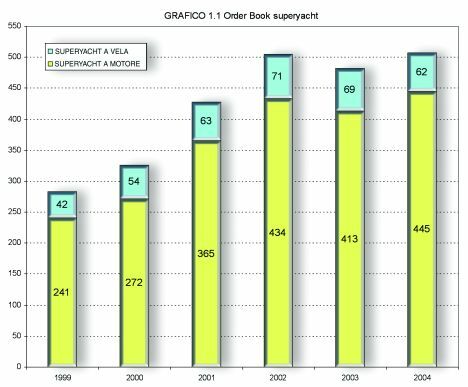 According to the Order Book for 2003-2004, there are currently 507 superyachts under construction worldwide, of which 198 will be launched by Italian yards. For the number of units produced, Italy's share of the world market is around 37%. Of the 507 superyachts under construction worldwide, 62 are sailboats and 445 motorboats with a prevalence of medium-small vessels. Subdivision of the orders by typology, and progress over the years, are shown in graph 1.1. Italy took up its leadership as major superyacht producer in 2000, overtaking the United States which had been undisputed leader theretofore. It should be recalled that in 1989 Italy had 70 superyachts under construction and the following year 100, reaching 170 units in 2002, 178 in 2003 and 189 in 2004, with a growth rate of 170% in five years. Graph 1.2 shows the order trend over the last seven years in Italy and at world level. Considering the percentage subdivision by superyacht length classes in the first five producing countries, it will be noted how roughly one third (in line with the previous year's trend) of superyacht production in Italy is concentrated in the range of 60 to 88 feet length, and about 60% in the range of over 100 feet (an increase in comparison with the 55% of the previous year): the average dimension of superyacht commissions in Italy is therefore still tending to increase. 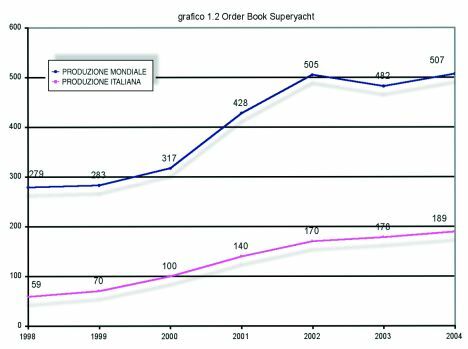 Lastly it is interesting to note how Italy, leader in superyacht production, is a very modest consumer of them: there are only 117 units greater than 80 feet registered in Italy, and in 2003 there were only 7 new registrations. Only a modest number of these vessels fly the Italian flag. With view to supporting the sector and therefore the overall Italian economy, the Law of 8th July, unanimously approved by the Italian Parliament, is highly important. Especially with regard to Article 2, which completely rewrites the regulations on pleasure boat charter, and Article 3 which establishes, dictating the entire discipline thereof, a category of pleasure yachts used exclusively for charter. However, it was clear that there was a lack of complete and adequate regulations, in spite of the fact that returning under the Italian flag by enrolling on the International Register involved tax benefits and relief. There thus arose the need for regulations that prescribed the technical and safety requirements for yachts destined solely for charter, and the need for a new decree on qualifications for pleasure boat sailing. The regulations are in line with their opposite number the Large Commercial Yacht Code, drawn up by Britain's Maritime Coastguard Agency (MCA). As for the contents, one notes considerable attention paid to design, construction and operational aspects, with the aim of always maintaining high standards in the concept and level of safety, both through the use of materials conforming with the most stringent standards and the application of International Norms and Conventions. It is with these premises that the heart of the regulations must be tackled, which is to say the part linked to plant engineering and structural protection against fire. But the great novelty in these regulations is the introduction of the concept of short range sailing, within 60 miles from ports of refuge in different countries and in any stretch of the sea. If authorised by the Administration, within 90 miles from a port of refuge on safe routes for which the vessel is suited, there is a less rigid and binding ruling that offers valid design compromises but always guarantees a high safety level. It might be helpful to recall the international conventions issued by the International Maritime Organization (IMO) applicable to this type of vessel: SOLAS, MARPOL 73/78, Laws 66, ISM, ISPS. UCINA's commitment should not only be linked to the new superyacht regulations but also to the training sector: this led to the founding of ViareggiofUCINA, "the school of yachting". 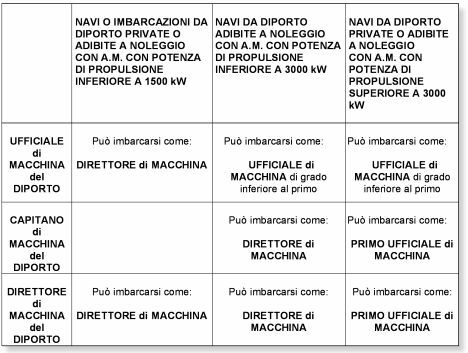 The primary aim of ViareggiofUCINA, and UCINA as reference partner, is to create a national monopoly in the sector of training personnel belonging to the industrial segment of pleasure craft sailing. Training offers for company managers and for keeping watch on board are also envisaged. For the latter, training must be integrated with the qualifications prescribed by the Maritime and Coastguard Agency (MCA), as well as the international requisites prescribed by the convention Standard of Training and Watch-keeping (STCW) 1995. 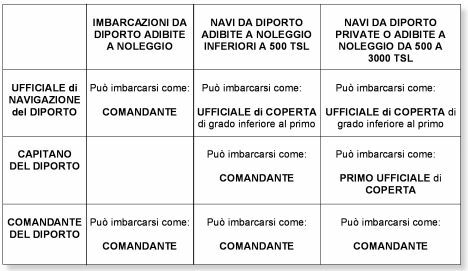 ViareggiofUCINA will also be the technical and qualifying reference of the Istituto Nautico for the training of professional figures in the sector, which today concentrates exclusively on large ships, to offer a better cultural background to new diploma holders. The operational instrument for training pleasure craft crew members will consist of modules managed internally and, where necessary, with participation in other local initiatives to which ViareggiofUCINA will contribute specific know-how. The courses are designed for people who have a technical background or nautical experience. The task of ViareggiofUCINA will be to specialise and so to speak refine the participants' skills, considering that an average number of 100 or at the most 130 enrolments are envisaged for the first year, but this number will continue to increase in the future.